Ohio’s recent financial problems have been a consequence of our leaders blindly reacting to the booms and busts of the past several decades without an understanding of business cycles. In the chart below, Ohio is shown to have experienced the same pattern in the rise and fall of tax revenues as the rest of the country. General revenues (red) increased in the 1990s, slowed down in 2000, increased in the mid-2000s, and started slowing down again in 2007. Rather than understanding that the rising tax revenues were the result of artificial booms, Ohio consistently mistook the rising revenues as a sign of a growing economy. The rising revenues became opportunities to increase spending. The pattern of Ohio’s expenditures (green) is nearly identical to the pattern of general revenues. Expenditures increased in the 1990s, slowed down in 2000, and increased throughout the 2000s. It was the erroneous increase in spending during the artificial boom of the mid-2000s that led to Ohio’s budget problems after the inevitable collapse at the end of 2008. Nonetheless, Ohio has still not learned its lesson on business cycles. Subsequent to the 2008 crisis, the Fed has generated a third artificial boom by holding the Funds rate to nearly 0%. Once again, the growing money supply has resulted in quickly rising revenues for Ohio and elsewhere. The rising tax revenues should not be a surprise. With a proper understanding of business cycles, the current rising revenues are an obvious sign of an artificial boom that must result in a future bust. Instead, the rising revenues have been misinterpreted as the result of a growing economy. Consequently, in response to the rising revenues, Ohio has once again promptly increased spending. In fact, thanks to the rising revenues, Ohio recently passed a budget that increases spending by 6%. Ohio’s crucial misunderstanding of business cycles provides frightening context to the MercatusCenter’s study on state financial conditions. Ohio was ranked seventh overall largely based on one factor, its large “rainy day fund.” Ohio had a ranking of second for short-term cash solvency. Yet, underneath the surface, the MercatusCenter’s study indicates that Ohio faces long-term financial problems. In the MercatusCenter’s study, Ohio had a ranking of thirty-sixth for long-run solvency. Ohio’s ranking of thirty-sixth for long-run solvency is alarming in light of Ohio’s recent error of increasing spending in response to rising revenues. The large “rainy day fund” is the result of Ohio’s rapidly increasing revenues, which is the product of the Fed’s monetary stimulus. The Fed, however, cannot hold down the Funds rate forever. When interest rates increase, the economy will go through another bust. Because Ohio has erroneously increased its spending in response to rising revenues, Ohio will need its large “rainy day fund” just to pay for its mistaken expenditures and long-term commitments. In fact, the latest billion dollar “rainy day fund” will likely be depleted just like the billion dollar funds exhausted after the previous economic busts in 2000 and 2008. In short, Ohio’s financial condition has not improved. Instead, Ohio has set itself up for yet another budget crisis. Ohio’s employment situation is not any better. Ohio’s workforce was hit hard after the 2008 crisis and it still continues to struggle. The payroll numbers in Ohio (red) remain lower than all of its neighbors’. The unemployment rate has been slowly falling over the last few years. However, the fall in the unemployment rate has actually not been a good thing. There has not been any real job creation in Ohio. In reality, the fall in the unemployment rate has largely been the result of a drastic decline in Ohio’s labor force, which has been on a steadily decline since 2009. The extent of the decline in Ohio’s labor force is even more noticeable when compared to the labor forces in all of Ohio’s neighbors. Ohio’s labor force (red) has been declining at a faster rate than all its neighbors except Michigan (green), particularly since 2011. Yet, even Michigan’s labor force grew at a faster pace than Ohio in 2013. It should not be a surprise that Ohio’s job creation continues to struggle to take off. The main policy enacted to tackle Ohio’s unemployment problems has been the program, JobsOhio. JobsOhio is a program designed to foster economic growth and job creation through the use of tax incentives and government loans. Such a program is helpful in providing a promise of future jobs from specific companies. However, such a program weakens the long-term foundation of an economy that prevents it from growing and creating jobs. A division of labor economy is dependent on economic competition to coordinate the use of capital through the use of prices and profits in the market place. The government incentives, by definition, alter the market’s coordination process. The Mercatus Center, discussing the problems of Ohio’s program, stated that it “distort[s] important market signals and redirect[s] private capital toward ‘government supported’ projects regardless of their merits.” Thus, such a program actually makes the economy less efficient and less productive. Moreover, such government interference in the economy is particularly harmful when the market needs to go through a necessary liquidation. Such a program diminishes the ability of profits to accurately and honestly redirect capital and labor to their best uses. A government-incentives program also ensures long-term unemployment problems. These policies by their nature are a contradiction to market forces. Thus, such a program usually creates a necessary market correction in the future resulting in a sudden loss of jobs, such as an abandoned facility. Of course, the market correction also results in lost tax revenue. A likely future loss of jobs resulting from Ohio’s program may be the recent deal with the Fuyao Glass Industry Group. Fuyao is a supplier of automotive glass to several auto companies including General Motors. The Fuyao investment will likely not pan out, because of its relationship with GM. The underlying structure problems of GM have never been fixed due to government bailouts and a manipulated bankruptcy. Furthermore, various government incentive programs were used to frontload consumer demand in an effort to prop up GM so the government could get a more favorable price for its stock holdings, which were still sold at a lost. Even with the stimulus, GM’s profits continue to underperform while its inventory has reached record highs. GM and Fuyao look like perfect examples of the mal-investment of capital that takes place during an artificial boom. And JobOhio’s incentives have added to that mal-investment. As the stimulus ends and interest rates rise, GM will once again struggle as well as other car companies and car-related industries like Fuyao. The job loss will likely be seen throughout Ohio. 1) Ohio needs to restore savings and capital to the depleted economy via massive cuts in government spending. 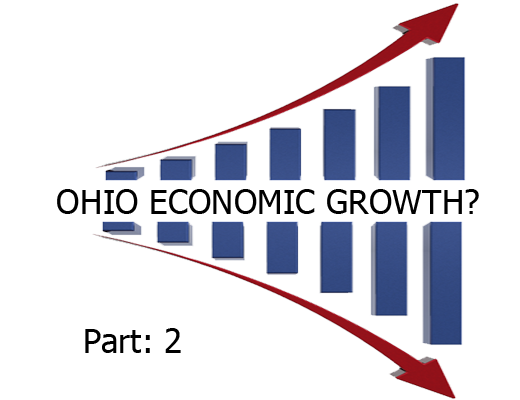 3) Third, Ohio needs to permit market forces to direct the allocation of savings and capital by ending the interference of the JobsOhio program and simplify Ohio’s tax code so that it provides a stable beacon for business investment during good and bad times. John Langenderfer is a practicing attorney with a focus in consumer and commercial law. He can also be reached on his Facebook page. READ ALL OCR articles by John Langenderfer here.